Like the Museum Square, this page will be updated! We appreciate your patience while we try to keep up. Bloomington-Normal has a new source for information about McLean County attractions, both historic and modern. The Cruisin' with Lincoln on 66 Visitors Center is located at 200 North Main Street in Bloomington, IL, on the ground floor of the McLean County Museum of History in downtown Bloomington. Both the Museum and the Visitors Center are accessed via our ground-level south entrance on West Washington Street. Bike parking is available on the entrance plaza, and parking for cars can be found one block south on Front Street at the Lincoln Parking Deck. Free 90-minute street parking is available throughout downtown. Street parking is free all day on weekends. What is the Visitors Center? The Museum has undertaken a significant new project which will attract thousands of tourists to our community. 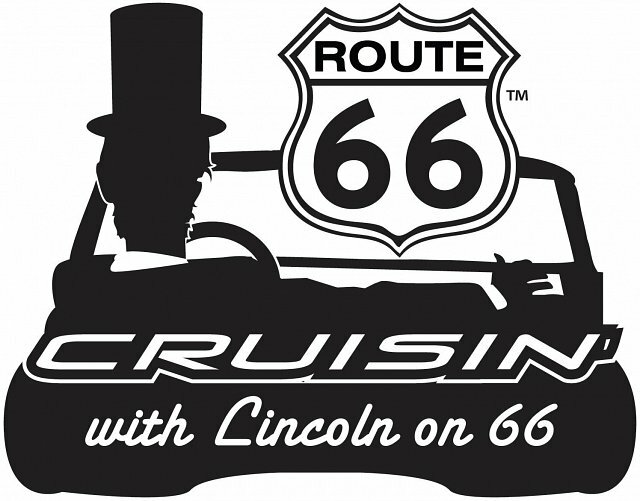 On July 27, 2014 we began construction on Cruisin' with Lincoln on 66: The Bloomington-Normal Visitors Center. It will be located in the ground floor of the Museum. This 1,200 sq. ft. center has been designed to attract to downtown Bloomington the more than 40,000 people a year who come to Illinois to drive on Historic Route 66, including weekend travelers and thousands of European and Asian vacationers. Here they will learn from and compare the experiences of Lincoln in his travels with those of automobilists during the golden days of Route 66. The exhibits will tell stories about dining, lodging, and travel. Accompanying the exhibits will be a reception desk, an expanded Museum store, videos, and digital kiosks with tourist information. We expect to attract 20,000 people by our third year of operation; of those, we anticipate 5,000 will visit the Museum, thus significantly increasing the Museum's earned income though sales and admissions. The center is expected to open in early summer 2015. Note: Accessibility for those with limited mobility will be affected by this construction. See our Visitor Information page for more details. Visitors will enter the center in though a broad plaza, located on Washington Street. The Lincoln Bench will be relocated to the plaza, a bike parking area will be established, and the center will be marked with new signage. Upon entry, visitors will be directed to the main hallway which will contain a set of brightly lit panels that will interpret Cruisin' with Lincoln on 66. 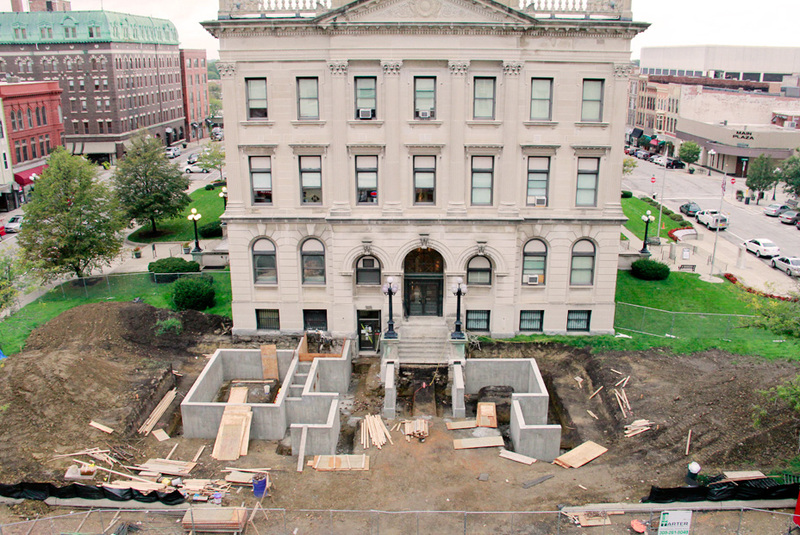 In anticipation of the new plaza on the Washington St. side of the Museum and trees to be planted on each quadrant of the square, an archaeological dig was conducted on areas that will be disturbed so features in the ground can be documented. 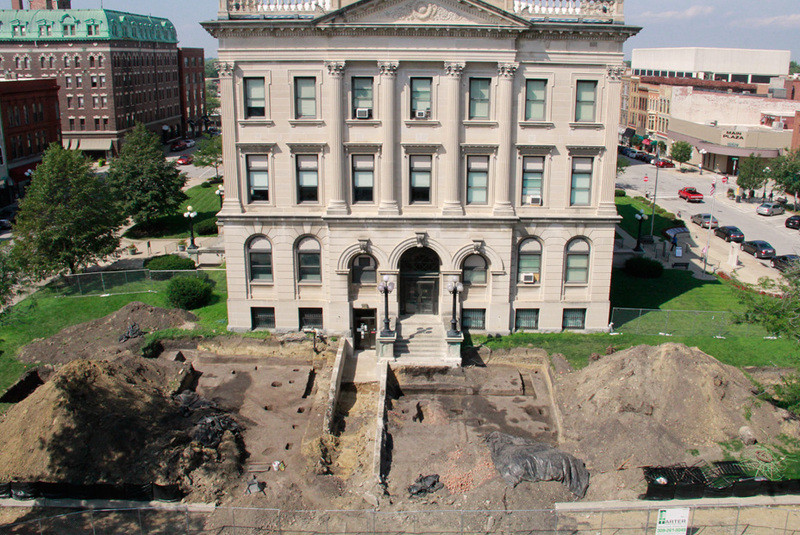 The archaeological dig phase has finished as of September 4, 2014. To read more about the potential research and discovery of this project, please read this Data Recovery Plan (PDF), and see the archaeology updates below. The project is funded though a $250,000 grant from the Illinois Department of Commerce and Economic Opportunity/Illinois Office of Tourism, Marketing Partnership Grant, with additional funding from the Bloomington/Normal Convention and Visitors Bureau and the Museum. Total Project cost is expected to be $510,000. The project was designed by Francois and Associates AIA, and Teller-Madsen, exhibit designers. Tarter Construction is building the project. 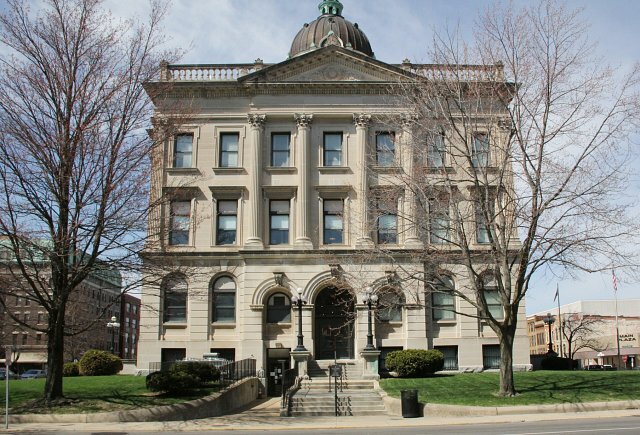 The Illinois Department of Natural Resources, Public Museum Grant Program has awarded $254,800 to the Museum for the purpose of building new public restrooms and restoring historic lighting in the Museum building, including making repairs to light fixtures in the courtroom, halls, and rotunda. Depending on costs, we hope also to replace the missing fixtures in the rotunda and library with reproductions of the original 1903 fixtures. This project will start in winter 2014-2015 and will be completed by spring 2015. UPDATE: The State of Illinois has placed this grant on hold until further notice. As of September 4, 2014, the archaeological dig portion of this project is finished. Analysis of artifacts and additional research will take place off site for a number of months. As mentioned above, the Museum has received some money from the state to do construction. Therefore, we are required by law to do an archaeological excavation of the sites that will be disturbed by new construction (though this is something we’d of course want to do regardless of state money!). All objects recovered in the project belong to the state and will be curated by the state museum. Digging on the grounds is one part of the project, but the analysis is the larger piece and will take 6-8 months. The 1836 courthouse feature has not yielded many artifacts. Things that were found include pottery pieces, an ink bottle, a pipe stem, and a padlock. 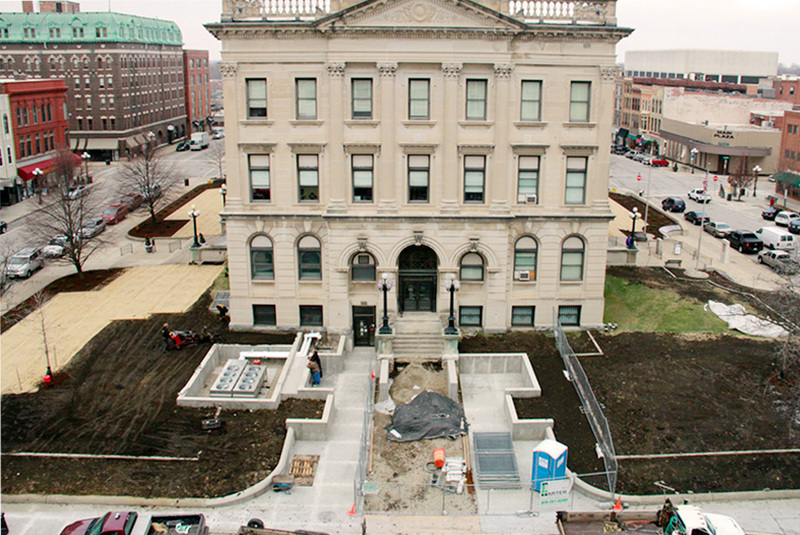 It is evident that whoever did the tear down and clean up of the courthouse did a very thorough job. They have found no unbroken bricks, no lath, no nails. There is a feature south of the courthouse feature that indicates burning took place, but why is unknown. 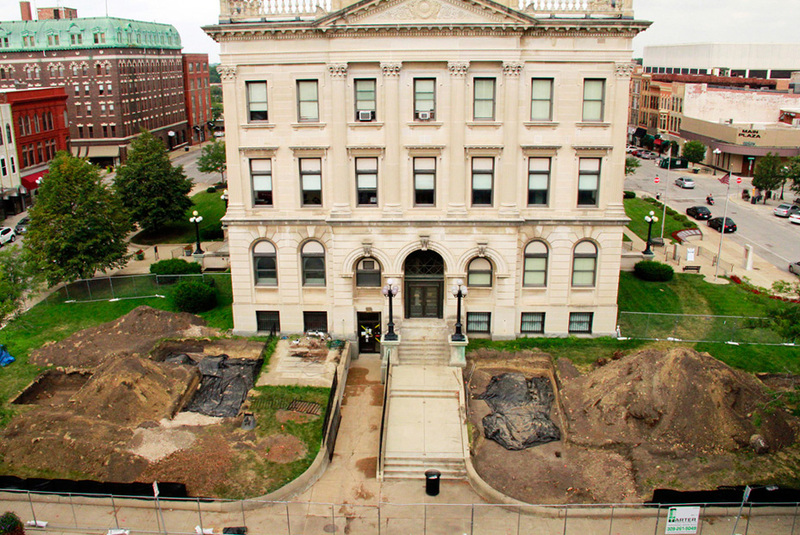 Excavation has taken place on the four quadrants where burr oak trees will be planted. Four 10’ x 10’ area were excavated. In three of them little or nothing was found. There are features that are believed to be related to draining water. In the NW corner they have found a section of the jail (1847-1858) and it appears that the area they have found was residential. They have found many bones- turkey, beef, lamb and a child’s bowl and chamber pot. Archival research shows that all the sheriffs from 1840-1860 had small children, so it is possible that the sheriff and family was living on site. Album: Pouring concrete March 19!